Let’s continue with the pandas tutorial series. This is the second episode, where I’ll introduce aggregation (such as min, max, sum, count, etc.) and grouping. Both are very commonly used methods in analytics and data science projects – so make sure you go through every detail in this article! Note 1: this is a hands-on tutorial, so I recommend doing the coding part with me! Where did we leave off last time? 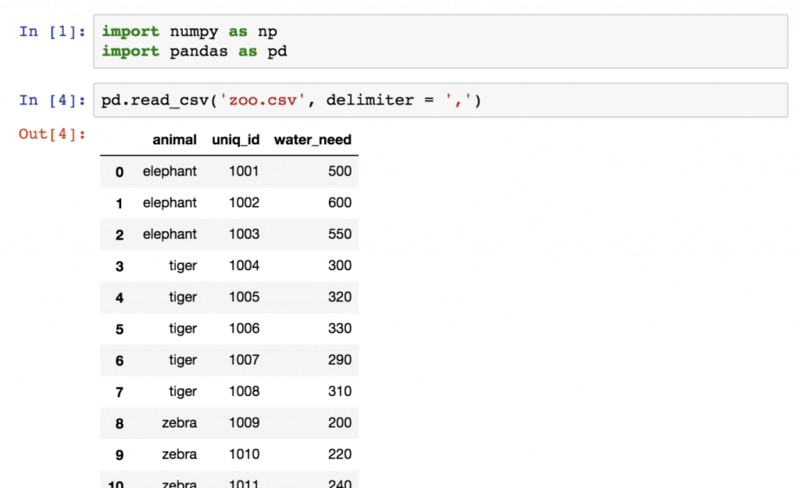 We opened a Jupyter notebook, imported pandas and numpy and loaded two datasets: zoo.csv and article_reads. We will continue from here – so if you haven’t done the “pandas tutorial – episode 1“, it’s time to go through it! Let’s store this dataframe into a variable called zoo. Let’s count the number of rows (the number of animals) in zoo! Let’s calculate the total water_need of the animals! Let’s find out which is the smallest water_need value! And then the greatest water_need value! And eventually the average water_need! Oh, hey, what are all these lines? Actually, the .count() function counts the number of values in each column. In the case of the zoo dataset, there were 3 columns, and each of them had 22 values in it. Okay, this was easy. Much, much easier than the aggregation methods of SQL. But let’s spice this up with a little bit of grouping! As a Data Analyst or Scientist you will probably do segmentations all the time. For instance, it’s nice to know the mean water_need of all animals (we have just learned that it’s 347.72). But very often it’s much more actionable to break this number down – let’s say – by animal types. With that, we can compare the species to each other – or we can find outliers. Here’s a simplified visual that shows how pandas performs “segmentation” (grouping and aggregation) based on the column values! 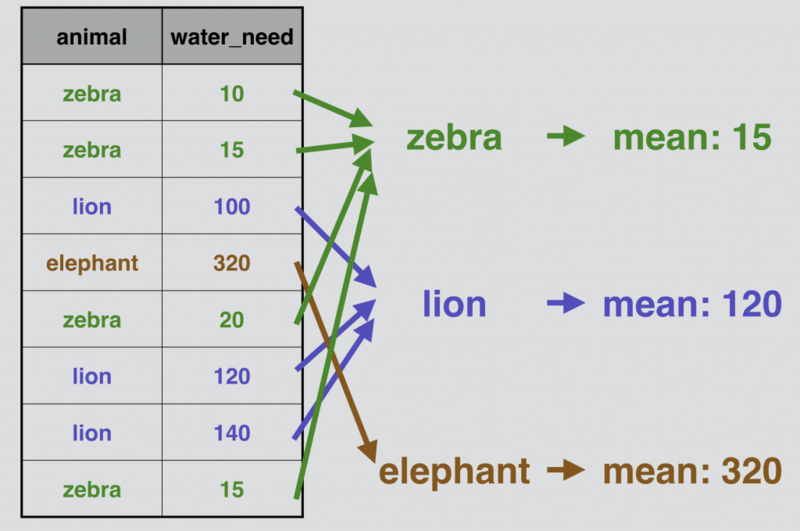 Let’s do the above presented grouping and aggregation for real, on our zoo DataFrame! Obviously, you can change the aggregation method from .mean() to anything we learned above! Okay! Now you know everything, you have to know! Let’s get back to our article_read dataset. 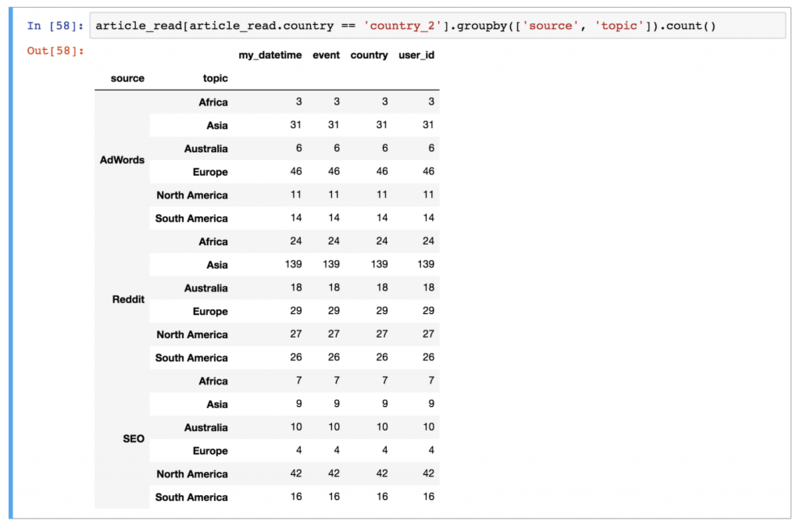 What’s the most frequent source in the article_read dataframe? And the solution is: Reddit! Take the article_read dataset, create segments by the values of the source column (groupby('source')), and eventually count the values by sources (.count()). For the users of country_2, what was the most frequent topic and source combination? Or in other words: which topic, from which source, brought the most views from country_2? The result is: the combination of Reddit (source) and Asia (topic), with 139 reads! And as per usual: the count() function is the last piece of the puzzle. This was the second episode of my pandas tutorial series. I hope now you see that aggregation and grouping is really easy and straightforward in pandas… and believe me, you will use them a lot! Note: If you have used SQL before, I encourage you to take a break and compare the pandas and the SQL methods of aggregation. With that you will understand more about the key differences between the two languages! In the next article, I’ll show you the four most commonly used “data wrangling” methods: merge, sort, reset_index and fillna. Stay with me: Pandas Tutorial, Episode 3! Great post. learnt a few tricks from it. Thank you.